What’s going on here with the Commodore lurking behind the Lieutenant? Is he her friend? Her mentor? her dad? Her lover? Her fashion consultant? A creep? A ghost? A German spy? CURIOUS MINDS WANT TO KNOW! …qualities that can come only from Chesterfield’s right combination of the world’s best cigarette tobaccos. For real smoking pleasure buy Chesterfields, They Satisfy. 1943 Liggett & Myers Tobacco Co. I think I got the 40s-era ranks right. Not much of a Navy presence here in North Dakota. 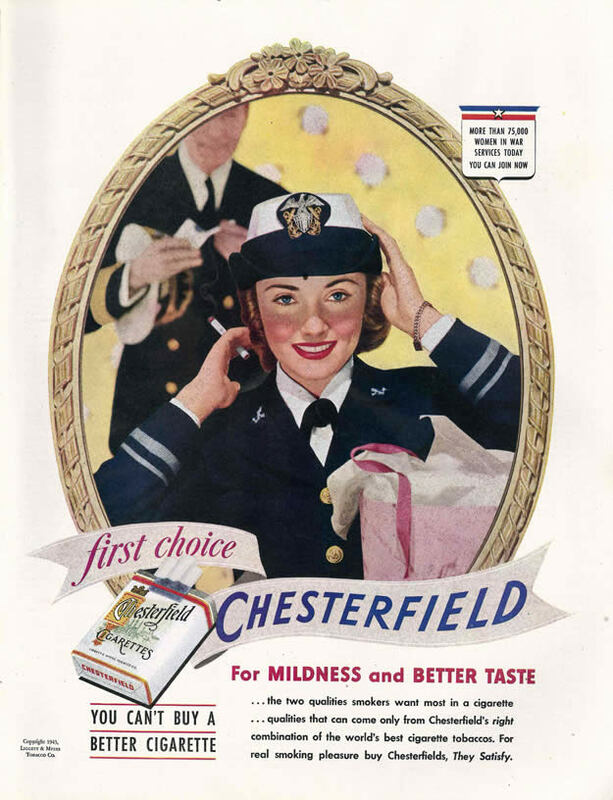 Looks like my grandmother, who was in the Women Marines and also just looooooved smoking! She was into Virginia Slims when I knew her. No idea what she smoked during the war.